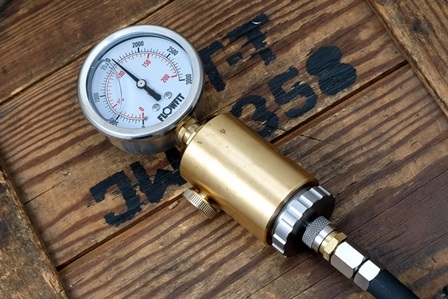 Let’s start from the basics – what is the regulator pressure tester? I know most of you know but maybe not everyone. It’s a device, which can measure the actual reduced pressure behind the regulator, so pressure which is in the plenum during shot cycle. And for tuning a PCP – this info is just crucial. Of course most people don’t care and just shoot what they got (and I was doing that for years) but if the access to regulator is easy (and in my EdGuns it is super easy) why not to play a bit and get the most of it? As you could have noticed I’ve really experimented recently a lot with Huma-Air products in my Matador R5 and Leshiy. In total I was playing with 3 regulators and 3 different plenum setups. For a start - the pressure scale on a brand new Huma-Air regulator is quite accurate. The problem is that constant tinkering with regulator and going too much back and forth with adjustment screw can get pressure scale misaligned with actual regulated pressure. Also when disassembling airgun many times it might happen that a tiny piece of dirt goes where it shouldn’t go and… regulator starts to leak. So the only way to make it working again is strip-down, full cleaning and re-lubing. And putting back together again. The problem is – your regulator won’t be aligned with pressure scale anymore. And you can be sure about it. And that’s when you need a pressure tester… and that’s when and why I got mine in the end. Of course there are more than just one solution available (some also custom built) but since my airguns run on Huma-Air… well, the logical choice for me was Huma-Air (of course). The good news is – whatever your airgun model is, and whatever Huma-Air reg / plenum combo you use, you just need ONE tester to check all of your units. The tester seals on the front and back of the regulator, so it doesn’t matter what’s the diameter of your air cylinder – it will work. What’s the procedure? OK, let’s assume I want to set 110 bar on my regulator. So I just need to drop my reg into to the tester, screw the unit together, attach your scuba bottle and pressurize the regulator for an instant read-out on the big (and precise) manometer. In my case after regulator reassembly I had actual regulated pressure of 135 bar when my scale was set on 110! That’s why I had power peak below 130 bar and well before my intended 110 bar. It’s none’s fault, that happens when you tinker too much with regulator. And last but not least… it costs 105 EUR at this moment. I’d say it’s easily justified price for what you get and for the benefits it can bring to your shooting (both air consumption per shot and shot to shot repeatability). Actually it’s equivalent of about 8 tins of JSB Exact… and what is 8 tins, lol! 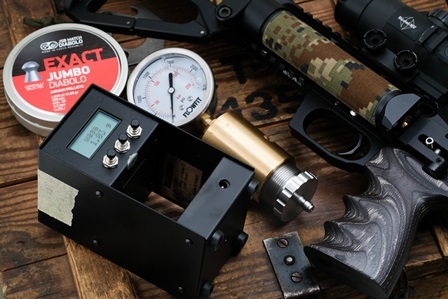 So if you’re serious about tinkering with your airguns, and if you own more than one Huma-Air regulator, I’d say: it’s a very good investment, which lets you keep your PCP’s under control for many many many years. For just 8 tins of JSB. And since Huma-Air offers upgrades for almost all major airgun manufacturers, it will work also when you decide to switch a brand or model of your airgun. Plus you should be able to sell it quite easily, if you don’t need it anymore for any reason.